The company SAT Plus, s.r.o. (Ltd.) as the very first one in Czech Republic now offers production of real HbbTV (Hybrid Broadcast Broadband Television) applications for digital TV broadcasting. Click HERE for more info about HbbTV. Providing Value Priced Optical Fiber Solutions especially for Video and Audio Production. 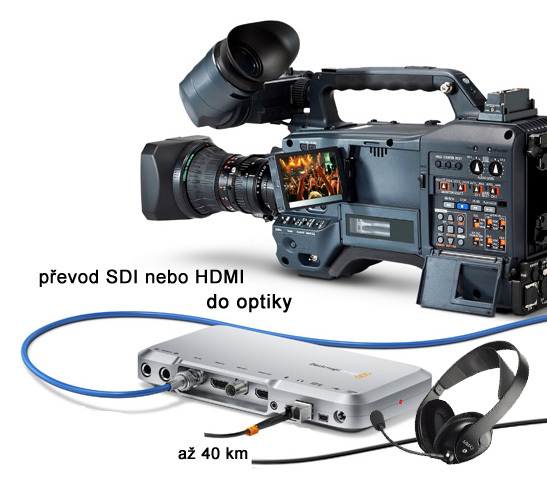 We offer various professional solutions for the delivery HD signal from your cameras to production over long distances using fiber optic cables. ﻿﻿﻿﻿The company SAT Plus, s.r.o. (Ltd.) as the very first one in Czech Republic now offers production of real HbbTV (Hybrid Broadcast Broadband Television) applications for digital TV broadcasting. HbbTV is currently possible to watch on all three TV channels that SAT Plus, s.r.o. broadcasts – HD+, FUN 1 and UPC Express. During the last months we have designed and developed 5 basic applications that illustrate the advantages and possibilities of HbbTV platform. All other applications are designed according the needs of particular broadcasters. The owners of TV channels together with the operators of digital cable/satellite networks can now, thanks to HbbTV, offer the access to new services, which their viewers and clients were used to access only via internet. These include various interactive services, online TV broadcasting, video on demand (VOD), targeted advertising, personalization, polls, games, social networks connection, TV channels' program overview and related information services, such as digital teletext. HbbTV platform is almost independent from TV broadcasting itself, because all the datas are transferred through the basic broadband internet connection. The connection port is currently included in most of modern televisions and set-top-boxes. So the TV/network provider does not need to spend another costs for data transfer to HbbTV application. This was unable with usage of older platforms that were later, due to that, proven unsuccessful. Our HbbTV applications fulfil the conditions for comfortable operation of all services by remote control (10 feet User Interface) and thanks to that, every piece of information is within reach. The user is able to read current news, check the program highlights, or watch the programme from the video archive of the provider. Thus, HbbTV platform becomes the new distribution way for marketing campaigns and the way, how to keep the viewer watching certain TV channel. First of all, we developed the application with detailed TV schedule for 30 days (120 TV channels, updated a few times a day). In comparison with classic EPG (Electronic Program Guide), the TV channel operator is not limited in possibilities of graphic interface, which was strictly given in EPG of TV and set-top-boxes. In HbbTV, these program datas can be improved with various graphic objects, TV channels logos, or screenshots from films, series, talk-shows and other program highlights. Next application is the RSS reader of chosen Czech news portals, enriched with traffic and weather information. Remaining applications consists of program highlights of premium TV channels, then current special offers of the network provider and simple video archive of the film trailers, which will expand in time and will also contain the archive of the various programs of TV channels. Moreover, in the stage of development there is the client application "My UPC", where viewers can check their customer accounts, order the services and contact the customer centre. “We are very proud that after several months of intense work we can finally present this unique technology, combining the possibilities of internet and television, to our viewers and provide them full access to real HbbTV applications. We are already working on development of new HbbTV applications. ", says Radomír Kaňok, CEO and owner of SAT Plus, s.r.o. 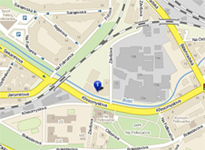 If you are interested in free presentation, do not hesitate to contact us or visit the address of our company in Prague. Master Control Room is the most important place for TV channels. It provides and coordinates the broadcasting of particular items, from which the TV program consists of. Master Control Room is also one of the most expensive parts of the TV studio and must be constructed before the actual start of broadcasting. Investment to the new technology and staff will be minimized if the customer uses our offer of external TV channel's broadcasting. SAT Plus Company, Ltd. is aware that there are many interesting topics for television, but due to high costs of operation it is not possible to realize many of these projects. Therefore, we prepared a variant where the customer only transmits parts of TV programs for broadcasting either on tape or in digital form and sends us the regular broadcasting schedule for each day. It is all what the customer has to do. Our technicians take care of everything else. Through the years of experiences with the TV broadcasting and connectivity to the backbone fiber optic and IP lines (including direct routes to satellite uplinks across the world), we are able to prepare each TV channel of the customer for broadcasting according to his requirements. It is not a problem for us to create and broadcast the TV channel with very low bitrate, which is very convenient especially for broadcasting via satellite. SAT Plus Company, Ltd. specializes in low-cost projects where most of the broadcasted materials is available in digital form and is transmitted directly from the disk servers. Every broadcasted program can be completed with station logo or any other graphics that can be remotely controlled using external data. All of our broadcasting equipments are connected via a central matrix system that allows easy switching signals for its own broadcasts, as well as for possible digitization of materials. Actually thru high-speed Internet connection we can route incoming and outgoing TV signal delivered through IP links and a make more efficient operation of the entire TV station. All files for TV broadcasting are stored on a central disk arrays, from which the materials are available via LAN for all servers in our Master Control Room, or for other operations such as digital editing rooms, voice over cabins, viewers, etc. It can take full advantage of the opportunities that provide video disk servers, and digital image recording. We can offer to customer the backup channel that can communicate with the prime server and if a problem occurs when broadcasting program, takes over its function. It can works in parallel with the main server too and then You can always switch the broadcast from one system to another. This ensures 100% backup broadcast program. Broadcast each program is executed depending on customer requirements. When preparing a new broadcast channel, we are able to offer customers video production and sound design for the new station and cooperation with production of their magazines. Our Master Control Room support broadcasting in high definition HDTV format of course. We can use files with compression format MPEG-2, MPEG-4 or DV and we can use tape machine in the P2 format, DVCAM and BETACAM-SP, for grabbing materials into digital form, or for broadcasting material directly from the player. According to customer request the final TV channel is prepared for further distribution in different formats. We can use composite, component and HD/SD-SDI video signal, analog, AES/EBU and SPDIF audio signal or the TV channle can be transmitted as UDP over IP LAN or DVB-ASI digital a digital stream. Thanks to the cooperation our company SAT Plus, Ltd. with several global companies distributing signals via satellite (satellite uplink) we can offer our customers any position in orbit - from America to Asia. 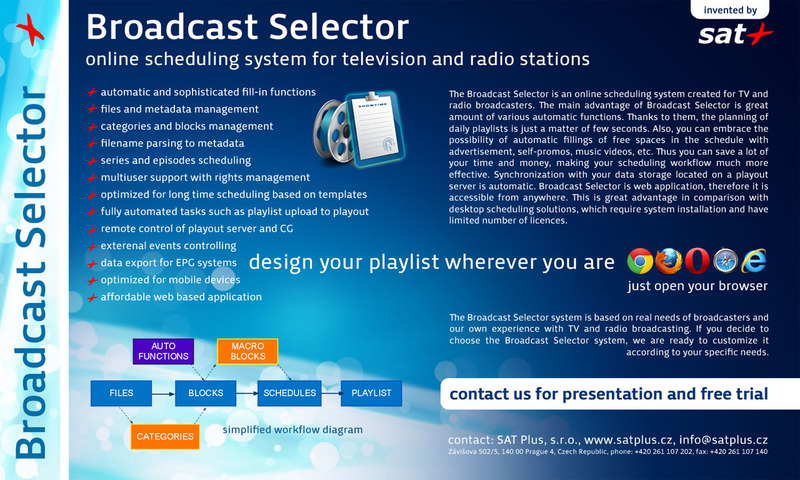 The Broadcast Selector is an online scheduling system created for TV and radio broadcasters. 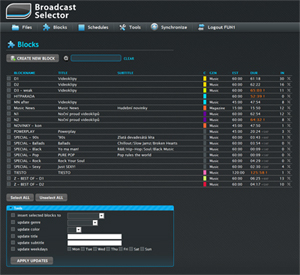 The main advantage of Broadcast Selector is great amount of various automatic functions. Thanks to them, the planning of daily playlists is just a matter of few seconds. Also, you can embrace the possibility of automatic fillings of free spaces in the schedule with advertisement, self-promos, music videos, etc. Thus you can save a lot of your time and money, making your scheduling workflow much more effective. Synchronization with your data storage located on a playout server is automatic. Broadcast Selector is web application, therefore it is accessible from anywhere. This is great advantage in comparison with desktop scheduling solutions, which require system installation and have limited number of licences. The application was developed based on the real needs of broadcasters and their own experiences with TV broadcasting. During implementation to the customer's project we can adjust some specific function to your specific demands or prepare the further expansion according to your needs. Try ON-Line Broadcast Selector for Free! We will send you login details to the demo version to be able try benefits this On-Line solution. Bank account: 1119437001/5500, Raiffeisenbank a.s. The SAT Plus, s.r.o. company deals with technology projects for low-budget TV channels, including broadcasting, production & postproduction and IT Solutions. Our solutions are complex and cost efficient, while maintaining high quality. 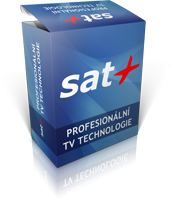 SAT Plus is also the owner of three TV broadcasting licenses for Czech Republic. © Copyright 2012 SAT Plus, s.r.o. Any use of content including articles and photos is prohibited.